It’s always sad to see your favorite stores boarded up for a remodel, but always very exciting to see their fresh new look when it reopens. Thursday night, I went to the reopening of the Kate Spade store in San Francisco. Let me just say, Kate knows how to throw a good party! There were tasty refreshments, delicious bites and a great preview of their new Fall collection. I picked up a few must have items and enjoyed mingling with other Kate Spade lovers like myself! It was quite the crowded event. 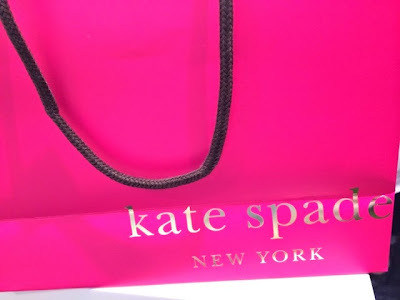 There were so many Kate Spade fans, it was a tad hard to move around, but we all found space to check out pieces we loved. The event had waiters passing out Perrier, Lorina Lemonade, cute little Cokes and glasses of champagne. Although I do love my champagne, I couldn’t pass up the cute glass Coke with a striped red straw! I really love the stores new look. There are a ton of bright colors, a healthy dose of pattern mixing and inspiring mottos placed all around the store. I found the cutest red party dress that I immediately fell in love with. It would be such a perfect ensemble for any holiday party. Definitely going on my wish list! All I have to say is Welcome Back Kate! You were sorely missed. I definitely needed one of these little wallets, but how to choose between a bright hue and a bow! How gorgeous are these shoes? Who can say no to a tasty macaron offered to you by a cute waiter? Kate knows how to color match! It would make the perfect holiday party dress! 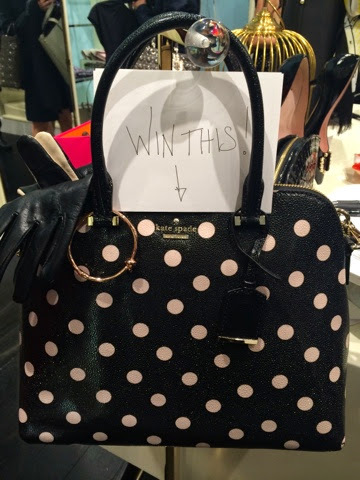 They had a raffle to win this super cute polka dot purse! Even a fun little GIF maker in the back!